When the No. 37 car of Chris Buescher was tapped from behind from the No. 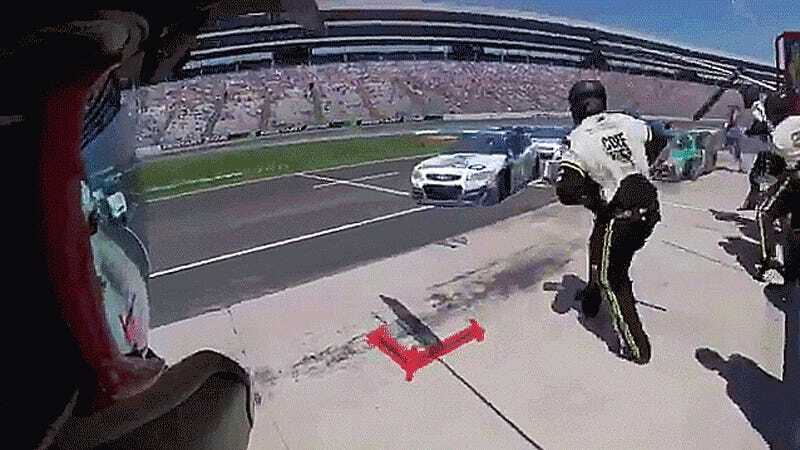 77 of Erik Jones in the pit lane during this weekend’s Monster Energy NASCAR Cup race in Texas, Buescher’s car spun around into its pits stall trunk-first—right into Buescher’s jack man Zack Young. Ouch! Cars were flooding into the pits after a competition caution on lap 30 of the race, according to NASCAR, hence the heavy traffic. Buescher’s front tire changer was recording the pit stop snafu, which shows Young getting tossed back over towards the pit wall. Another team member hopped in to do Young’s usual jack duty to get the car back out on track as soon as they could, as Young went immediately to Texas Motor Speedway’s infield care center. Fortunately, Young was okay, but sore, with some injuries to his hand along with some bruises. Nothing in his hand was broken, according to NASCAR. I can’t help but think that they did this backwards, though, and not just because of Buescher’s dramatic entry into the pit stall. The car is supposed to go up in the air, not the jack man. Why Do Oval Tracks Have Painted-On Lane Lines?